Lead generation in inbound marketing takes patience. It’s about crafting killer content and performing a meticulous process of distribution actions that is repeated faithfully each week. In other words, it’s not about the outcome. It’s about the process. We found a great example of this concept in a story actor Will Smith shares about his childhood. At age 12, he and his 9-year-old brother were tasked with rebuilding a wall in front of his Dad's small business. At such a young age and while staring at a huge pile of bricks, Will was doubtful of his ability to build such a structure. The elder Smith took this time to teach him that his job was not to build a wall. You don't build a wall. Walls aren't built. A wall is simply the end result of laying the perfect brick, over and over again, for an extended period of time. A wall is a result. Taking this lesson to heart, Will and his brother completed the entire wall in about a year and a half by focusing all their efforts on laying each brick as best as they possibly could, over and over again. The wall still stands today. 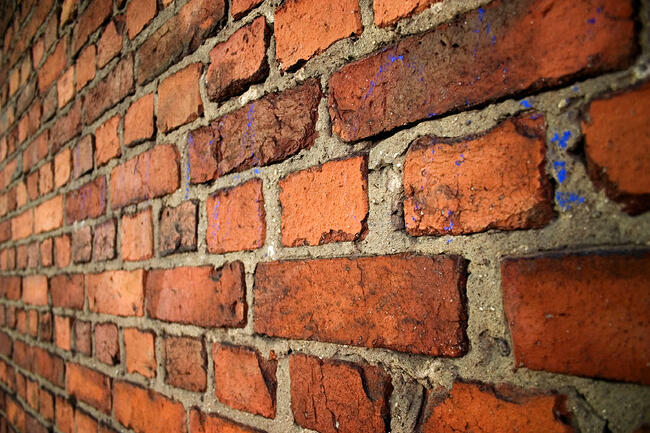 In inbound marketing, conversions are the wall, but you can’t get to conversions without laying a few bricks. Below are 5 “brick-laying” techniques to build a sturdy inbound marketing wall. This step is very important, as it will guide your creation of the processes you create. Follow the SMART format. Make sure that your goals are Specific, Measurable, Attainable, Realistic, and Timebound. Refer to this great worksheet from Hubspot on creating SMART goals. Determine how many blog posts, landing pages, emails, and tools you'll be using, it will take to meet goals. If you know, on average, you earn five new subscribers with every blog post and your goal is to earn 100 new blog subscribers over the next three months, then plan to write 20 blog posts over that time period. Outline exactly what you will do every single day to follow the action plan. For example, "I will have a writing session every day from 9AM to 10AM in order to deliver my bi-weekly blog, which I will post on Tuesdays and Thursdays. An email will be sent to every subscriber and I will also share those posts 3 times per day on Twitter and Google Plus, no matter what." It takes time to win prospects in inbound marketing. Focus more on the process early on than the results, but do monitor important metrics like social shares, comments, and page views (to name a few) and make adjustments to content and distribution strategies in order to build on what’s working and increase engagement. Re-arrange your schedule around this process. Commit to creating a habit of writing every day and publishing on time, every time. Commit to the social media and distribution schedule you have established. Learn to love this part of the process. It is in these efforts that you will ultimately reach your goals, generate leads, and increase conversions (revenue). It can be difficult as marketers and thought leaders to put our heads down and focus on the work involved in inbound marketing, especially if you consider yourself an “idea guy”, but focusing your attention on the process is what will get you to the finish line. Never miss another post! Sign up to get new blogs sent to your inbox.